Once you’ve completed your initial orthodontic treatment, you probably can’t wait to celebrate your new smile. However, our Amherst, NY, orthodontist reminds you that your orthodontic treatment is not over – yet! After your braces are removed, you will have to wear a retainer to guide and maintain your teeth’s new alignment. You Just Got Your Retainer from Our Amherst, NY, Orthodontist. Now What? 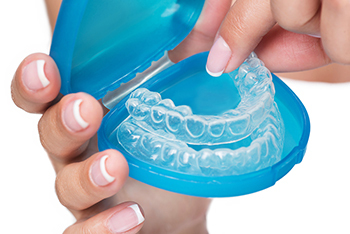 If you wear a retainer or just received your retainer for the first time from your Amherst, NY, orthodontist, you might be wondering how to care for it. Your retainer fits snugly in your mouth right up against your teeth, so it can easily accumulate bacteria, plaque, and tartar. Just like you brush your teeth every day, it is also important to clean and disinfect your retainer daily. According to our orthodontist, your mouth is a warm, moist environment filled with bacteria that can cause a buildup of plaque and tartar on your retainer’s surface. Even just a quick rinse in warm water helps to combat some of the bacteria that can accumulate in your mouth throughout the day. Our Amherst orthodontist recommends that every time you remove your retainer for a meal, make a point to rinse it under warm water before putting it back in your mouth. One of the easiest ways to clean your retainer is to brush it at the same time that you usually brush your teeth, either in the morning or the evening. Using a soft bristle brush will prevent scratches from forming on the retainer’s surface – which can lead to tiny crevices trapping unwanted bacteria. Our orthodontist in Amherst, NY, suggests that you keep a second toothbrush handy solely to clean your retainer. If you notice debris on your retainer that won’t come off, take it to your next appointment with our Amherst, NY, orthodontist. More Than A Smile can help! Our Amherst, NY, Orthodontist Wants You to Have a Healthy, Straight Smile AND a Fresh, Clean Retainer! Not All Cleaners Are Created Equal! Our orthodontist in Amherst, NY, wants you to know that traditional denture cleaners are NOT the best way to clean your retainer. Some of these cleaners contain a chemical called persulfate, known to cause allergic reactions in some people. Another commonly used retainer cleaner is mouthwash, although our Amherst, NY, orthodontist cautions that some brands contain ingredients that can cause your retainer to become dry and brittle. Even certain toothpastes can cause scratches or abrasions on your retainer’s surface. Our expert orthodontic team suggests that you use a mild dish soap, or try a mixture of lukewarm water and baking soda to gently – but thoroughly – clean your retainer on a daily basis. For information about caring for your retainer –or for any other issues regarding your orthodontic treatment at More Than A Smile Orthodontics– please don’t hesitate to call 716.633.4747 to reach one of our helpful staff members. We look forward to hearing from you! The information provided in this article is not meant to be medical advice and is for educational purposes only. If you would like to learn more about this and other topics related to orthodontics, feel free to contact More Than A Smile Orthodontics with a convenient orthodontist office in Amherst, NY, by calling 716.633.4747 or click here to schedule a complimentary exam and consultation with our More Than A Smile orthodontist.